Shiitake, cremini, and white mushrooms are the mushrooms that make up this earthy and meaty mushroom stuffing. 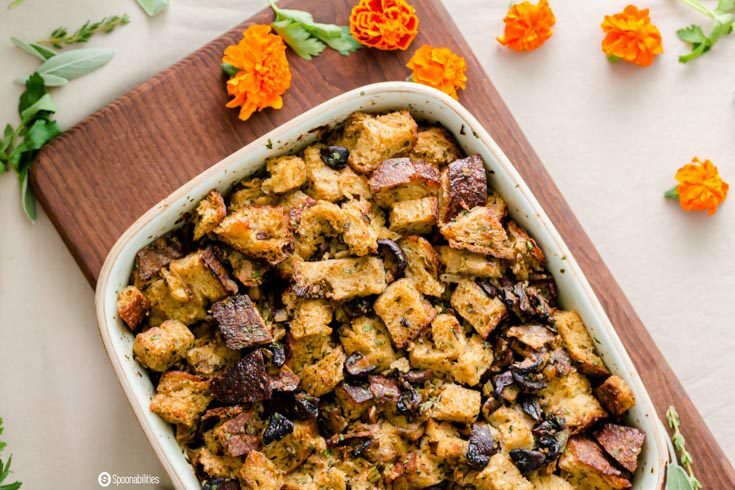 Combine that with fresh herbs like sage, thyme, parsley and a few veggies for a flavorful and satisfying side dish for your Thanksgiving dinner and other gatherings during this holiday season. Sourdough bread is the perfect matching bread for this recipe with its health benefits along with its crusty crust and airy inside for a perfectly moist bite. 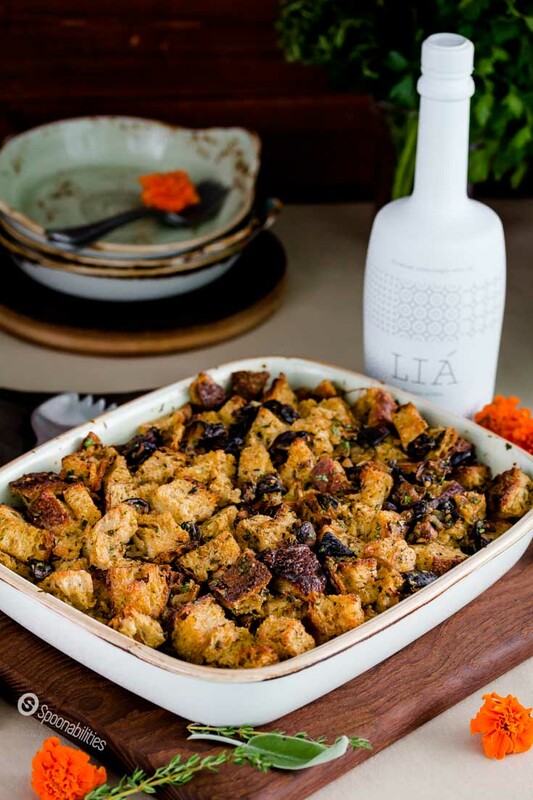 This stuffing recipe is butter free and made with the highest quality Extra Virgin Olive Oil from Greece: “Lia” available in our online shop. Hello my friends. This week we will be sharing three recipes with you. Yes, you heard right. As I mentioned in my previous post, I was thinking to release a bunch of recipes in the next couple of weeks, and I finally decided to do it because Thanksgiving is right around the corner and you are probably already looking for side dishes recipes. 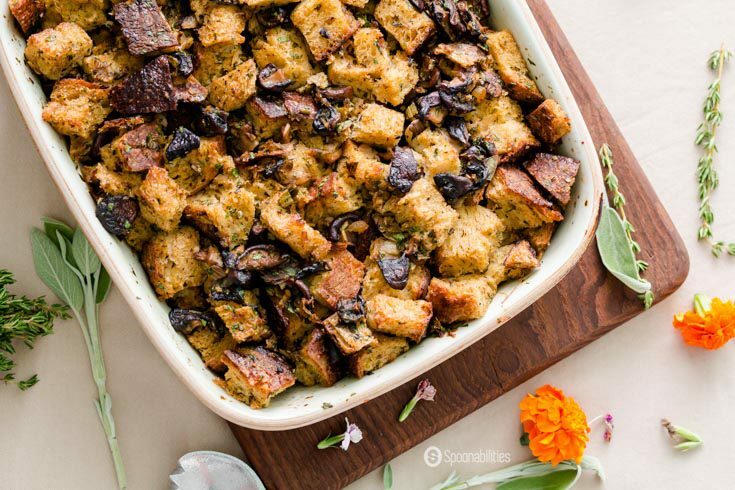 This first side dish is the Shiitake Cremini White Mushroom Stuffing with a beautiful earthy, meaty taste with fresh and aromatic herbs and a rustic sourdough bread. For this mushroom stuffing recipe, I’m giving you three variations to match your liking. The options are vegan, vegetarian, and one with Spanish chorizo for those who can’t live without meat:). See details on the recipe card. 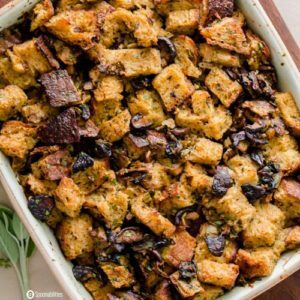 It’s my first-time cooking stuffing, and this mushroom stuffing was super simple, easy and quick to make. First cut the sourdough bread into cubes, and pop it in the oven for 30 minutes. After the bread cubes are done, put them in a large bowl. 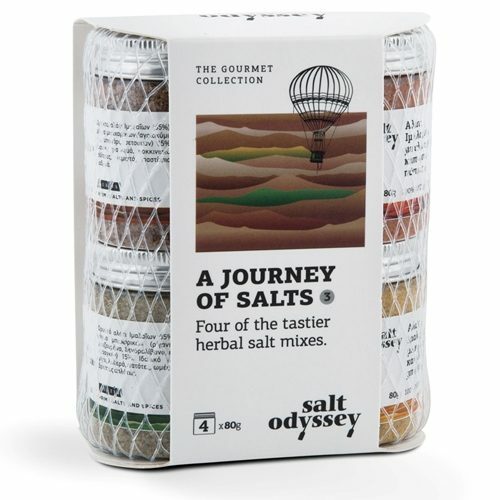 The next step is to sauté the mushrooms with salt (Salt Odyssey – buy it here at Spoonabilities) for about 5-7 minutes and then mix them with the bread. Meanwhile, cook the onion, celery, thyme, oregano, and garlic with a sprinkle of the sea salt (Salt Odyssey), and add that mixture to the rest. In a large mixing bowl combine chicken stock, olive oil and eggs. Pour half of the stock mixture over the bread mixture and toss; add the rest of the stock mixture and toss again. Add salt & pepper and toss again. Place the mushroom stuffing mixture in a greased baking dish. Leave it for 30 minutes to let the bread soak up the liquid, stirring halfway to make sure every piece of bread gets moist. Bake for 30 minutes. Ok, so that sounds like a lot of steps, but it’s really fast and easy. I always like to find interesting facts about each ingredient I use in my recipes. Today for the mushroom stuffing recipe I was curious about Sourdough Bread. Do you know Sourdough Bread is one of the healthier breads? Sourdough Bread is easier to digest due to the combination of bacteria-yeast working to predigest the starches in the grains. The more prolonged soak and rising times in the preparation of sourdough breaks the protein gluten into amino acids, making it more digestible. It’s beneficial for people who eat a lot of bread products, except for the gluten-free people because this bread is not gluten-free. Sourdough Bread has acetic acid, which inhibits the growth of mold, which is produced in the making of sourdough. So, sourdough naturally preserves itself. 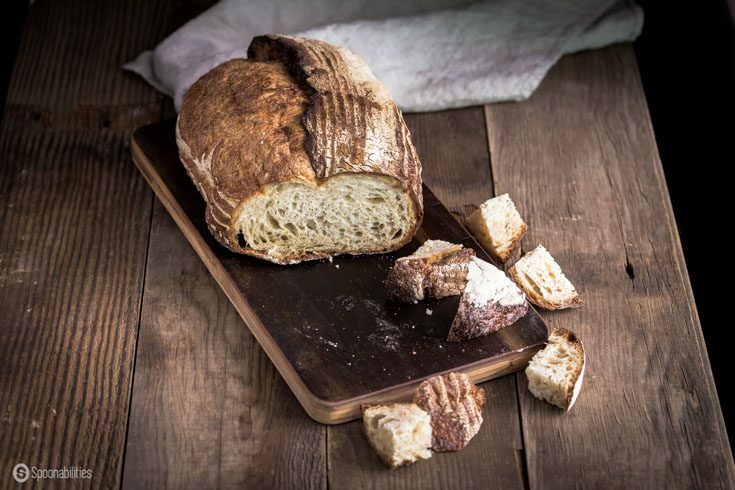 Sourdough Bread has lactic acid bacteria (LAB) which produces beneficial compounds: antioxidants, the cancer-preventive peptide lunasin, and anti-allergenic substances, some of which may help in the treatment of auto-immune diseases. Sourdough Bread contains a lot of nutrients and vitamins like B1-B6, B12, folate, thiamin, niacin, riboflavin, vitamin E, selenium, iron, manganese, calcium, magnesium, phosphorus, zinc, and potassium and uniquely equivalent proteins and fatty acids. If you want to know more about Sourdough Bread, visit the blog Cookusinterruptus where I found most of the information above. Have an antiviral, antibacterial and antifungal properties. 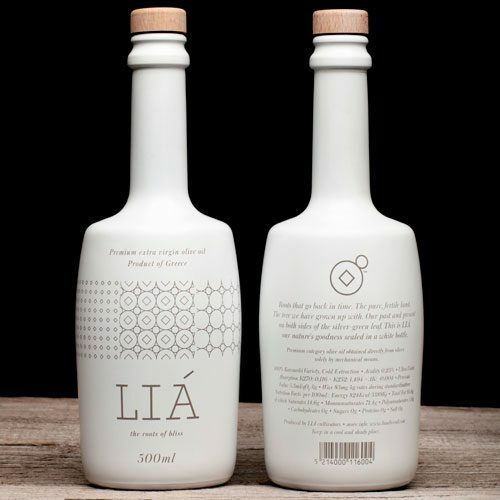 Contain many chemical compounds that protect your DNA from oxidative damage. As per my past experiences and not all were good experiences, here is what I learned trying to extend the life of these precious delicatessen. Put the mushrooms in the refrigerator as soon you return from the supermarket. Don’t clean them until you are ready to use them. You can keep them in the container that you got from the supermarket, but the best idea is to place them in a container with a paper towel on the bottom and on the top. I use a rubber band to hold the paper towel on top of the container. This will prevent the mushrooms from getting slimy and still will allow air to flow in and out the container. Do not close with a tight lid. Do not use a plastic bag. My last batch of mushroom lasted 10 days in these conditions. 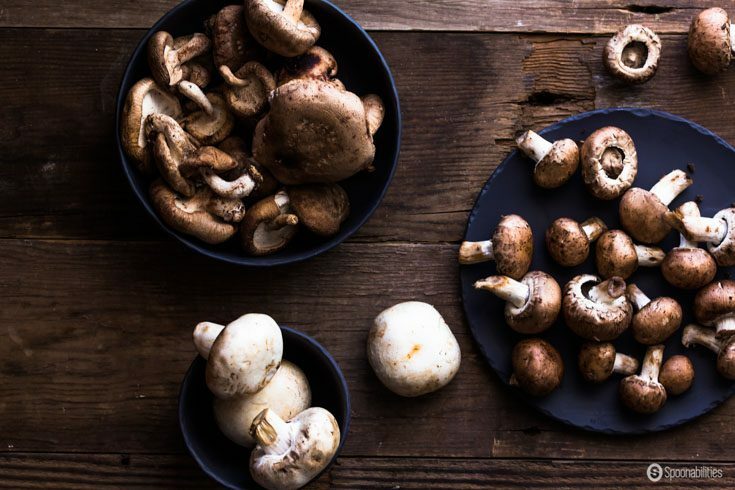 The best way to clean mushrooms is with a damp paper towel. Never put mushrooms under water because they absorb liquid very easy. For this three mushroom stuffing, I didn’t use butter at all and instead made this side dish only with olive oil. I used an exquisite Greek extra virgin olive oil called ‘Lia.” At this moment I have 3 or 4 different bottles of extra virgin olive oil open that I used for previous recipes like Eleon EVOO from Navarino Icons that I used with the yellow pea shoot salad & roasted pumpkin bisque, Melies EVOO with the fresh stuffed squash blossoms, and Five EVOO with the Instagram recipe stone fruit caprese salad. Honestly, if you haven’t noticed, I’m in love with Greek products from our friend Vivianna at Hellenic Farms. She imports top quality Greek products like honey, herbs, tea, spread, balsamic vinegar, olive oil, gourmet salts, and other tasty snacks. We have some of her products in our e-pantry, and soon we will have more. Also, we are creating some exclusive gift sets which will be a perfect gift for your foodie family and friends. Meanwhile, check out our current gift sets available right now. November is a busy month for me at work traveling to the Caribbean. Two weeks ago, I was in the Bahamas. Right now I just left Jamaica. Next week I probably will be writing the blog post from Grand Cayman, and for the last leg of my traveling season I will be in my lovely country of Dominican Republic. If you want to check out my traveling adventures, follow me on Instagram and check out my stories. This is tough work, right? 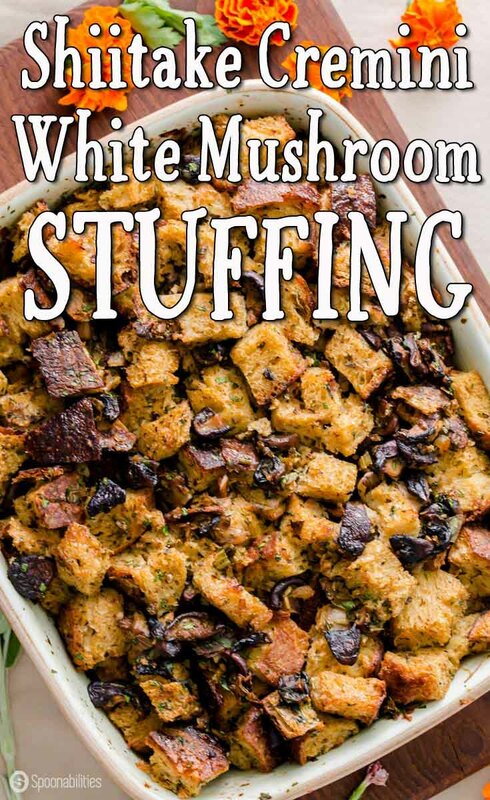 Let me know if you get to make this shiitake, cremini, white mushroom stuffing recipe, and share your pictures, tagging us on Instagram or on our Facebook Page. This Mushroom Stuffing Recipe is loaded with fresh herbs, and flavorful with the meaty and earthy taste of Shiitake, Cremini, and White Mushrooms. The sourdough bread cubes are moist on the inside but still crispy on the outside. 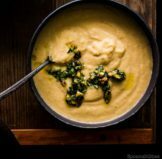 For this recipe, I offer both vegan and vegetarian options. Preheat oven to 400°F. Arrange sourdough bread cubes in a single layer on a rimmed baking sheet. Bake at 400°F for 20 minutes. Leave aside. Reduce the oven temperature to 350°F. Heat a large skillet over medium heat. Add 3 TableSpoons olive oil and add mushrooms, add a 1/4 teaSpoon of salt (Salt Odyssey) & pepper. Cook for 5 minutes until the juice from the mushrooms evaporates. Add 1 TableSpoon sherry vinegar, scraping pan to loosen browned bits and add the 1/2 cup of Riesling wine and keep scraping the pan. Add this mushroom mixture to a large bowl. Return skillet to medium heat and add 2 TableSpoons extra virgin olive oil. Add onion, celery, thyme, oregano, and garlic. Sprinkle a 1/4 teaSpoon of salt (Salt Odyssey) & pepper; sauté 5 minutes. Add the chopped sage and stir, and add 2 TableSpoons of wine; cook until the liquid evaporates. Remove pan from heat; stir in parsley. Add onion-herb mixture to the large bowl with the mushroom. Then, add the bread to the mixture; toss to combine. Combine chicken stock, 2 TableSpoons olive oil and eggs in a bowl, stir. Pour half of the stock mixture over bread mixture and toss; add the rest of the stock mixture and toss again. Add a 1/4 teaspoon of salt (Salt Odyssey) & pepper and toss again. Spoon mushroom-bread mixture into a 2-quart ceramic baking dish coated with olive oil. Let stand 10 minutes or until liquid is absorbed, stirring occasionally. Drizzle more olive oil on top before putting in the oven. Use vegetable stock instead of chicken stock. Bread Replacement: Check the ingredients because some stores have vegan whole wheat bread - no milk added. Add dried cured Spanish Chorizo in the mix before putting it in the oven. Yum. This is a major upgrade from my regular boring stuffing. You are right Brandi! This mushroom stuffing is an elevated version of the traditional stuffing. This looks so good and I can only imagine how fantastic it smells too. And for less than 300 calories per serving, yes please! Yes, It was very aromatic and super delicious! your stuffing looks amazing and even if we do not celebrate Thanksgiving, I might just so I can make it. Thank you for the information about the sour dough bread, I needed more reasons to justify my indulgence. You are very welcome Laura! I always like to find excuses to eat more bread:) I truly appreciate your comment! I just LOOOVE mushrooms! What a great combo here! And thanks for the vegan tips! You are speaking my language. Love the big chunks of bread and all those mushrooms. Pinned to my Must Make board. This looks absolutely delicious! This would be perfect for Thanksgiving. I may have to try this recipe this year. Yummy! Hi Luci. Do give it a try for Thanksgiving. We would love to see your take on it and pictures! Thank you Monika. Just wait until you taste it. I love mushrooms so this is looking mighty good to me – will definitely have to give it a try! I love that it is less than 300 cals per serving too! Thank you for your comment Bintu. Carlos loves mushrooms too (me not so much) but this stuffing really is delicious. Awesome post! That recipe Looking so delicious. But i wanna make the Meat version. Thanks for sharing. Thank you Monica! Yes, the chorizo gives it a great extra flavor with a little kick. Thank you so much for pinning. Do let us know when you try it. I love the updated flavors with sourdough and mushrooms. Hi Juli. 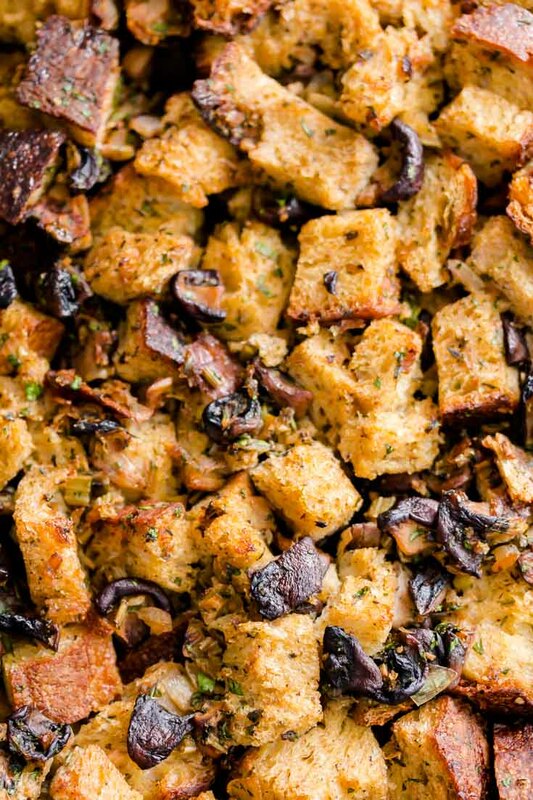 So glad you love the sourdough and mushrooms in this stuffing recipe. Hope you give it a try. 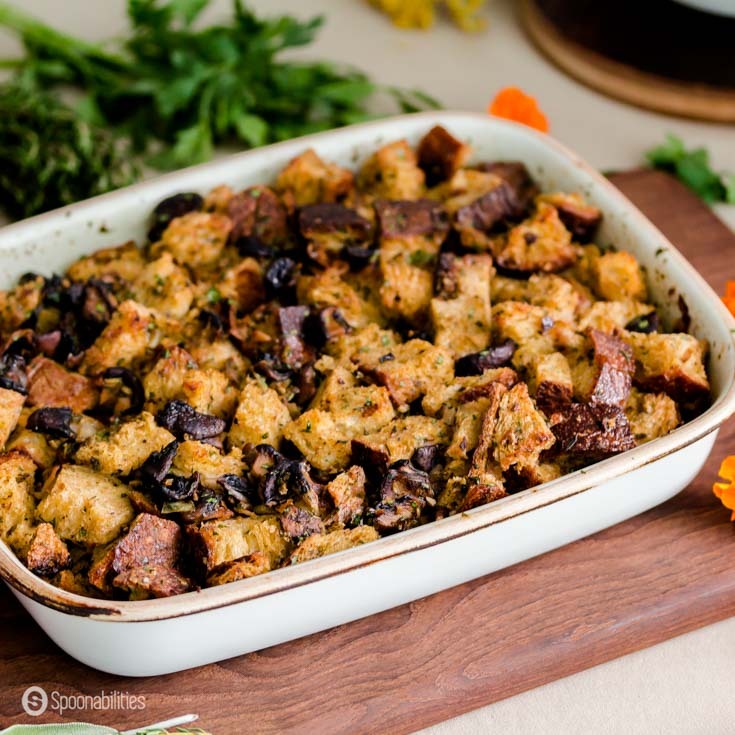 Thank you so much Diana for pinning our Mushroom Stuffing Recipe. Do let us know when you try it and give us your opinion on how it tastes. If you love all kinds of mushrooms as you say, you will really love this side dish. Not generally one for stuffing, but loving the addition of mushrooms and your flavours!! Thanks for taking the time to leave us a comment Jacquee. 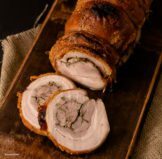 It’s great that you are not a big stuffing person, but still like the recipe. 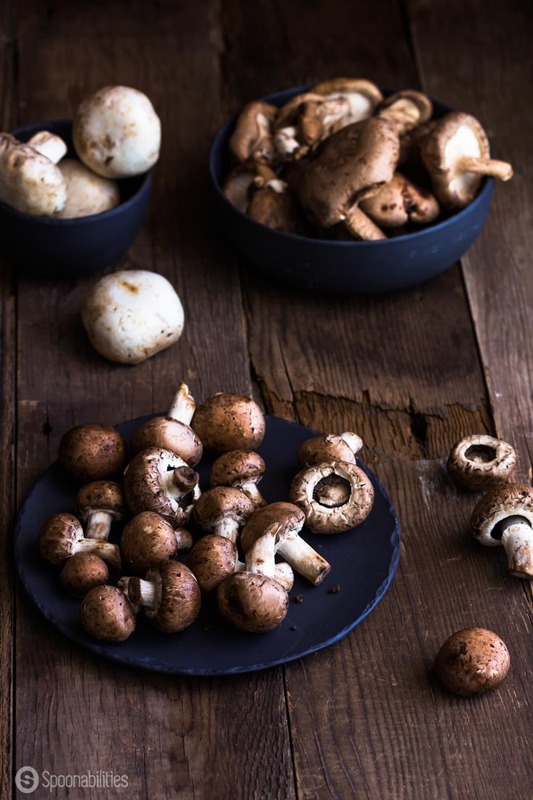 Great tips on storing and cleaning mushrooms. This stuffing would be perfect alongside a turkey. Hello Ellen. Yes, any turkey would jump on the table to be next to this stuffing. Thanks for noticing the mushroom tips, and thanks for leaving a comment.